BACKGROUND AND PURPOSE: Endovascular treatment of wide neck aneurysms often results in incomplete occlusion or aneurysm recurrence. The two goals of the present study were to compare results of coil embolization with or without the assistance of an aneurysm neck bridge device (ANBD) and to explore the use of this instrument to control cyanoacrylate embolization. METHODS: Wide necked bifurcation aneurysms were constructed in 28 dogs. Coil embolization of the aneurysms was performed 2 to 4 weeks later, with (n = 11) or without (n = 10) ANBD assistance. In seven other animals, embolization was performed with cyanoacrylate, injected under the protection of ANBDs. Angiographic results were compared immediately after and at 3 and 12 weeks. Neointima formation at the neck was also compared between groups at 12 weeks. RESULTS: Initial angiographic results and recurrences at 12 weeks were not significantly different in aneurysms coiled with or without ANBDs. Neointimal scores were also similar. The use of one ANBD at the neck was not sufficient to safely deliver cyanoacrylate into aneurysms. 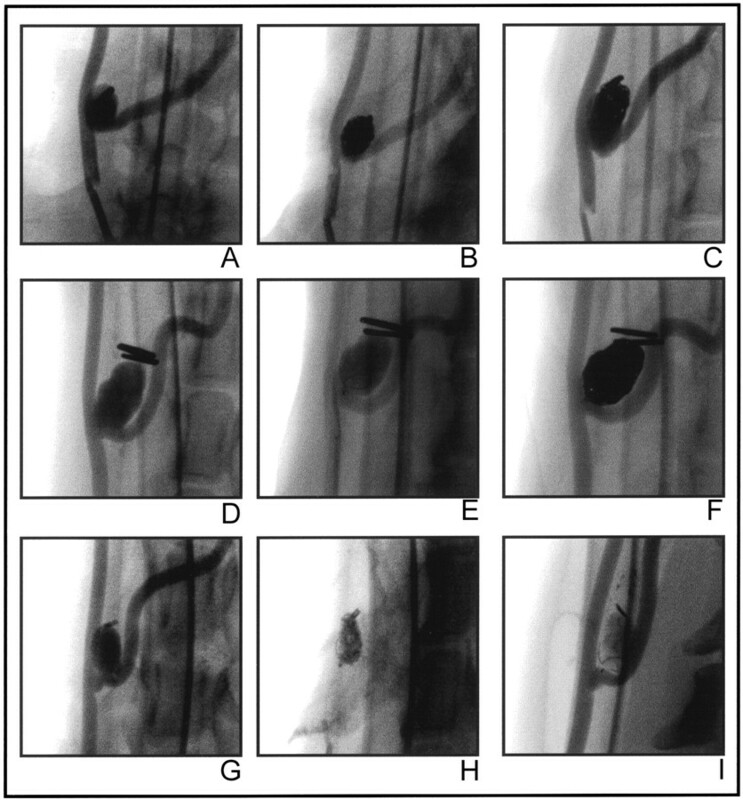 Cyanoacrylate embolization led to improved angiographic results (P = .05) and to better neointimal sealing of the neck of the aneurysms at 12 weeks (P = .004). CONCLUSION: ANBDs did not prevent recanalization and recurrences after coil embolization of wide neck aneurysms in this animal study. ANBD-assisted cyanoacrylate embolization was unsafe but could decrease recurrences at 12 weeks. Endovascular treatment of wide neck aneurysms can lead to incomplete occlusion and aneurysm recurrence (1–3). Attempts at complete obliteration of wide neck aneurysms increase the risks of coil protrusion, embolic complication, or thrombosis of the parent artery (4, 5). The TriSpan (Target Therapeutic/Boston Scientific Corporation) is an aneurysm neck bridge device (ANBD) that was designed to assist GDC embolization of aneurysms. Initial animal and clinical reports on this ANBD have shown the feasibility of using this strategy in wide neck intracranial aneurysms (6, 7). However, important issues such as the potential of the ANBD to improve initial angiographic results or decrease the incidence of recurrence, compared with unassisted embolization with coils, remain unsettled (6, 7). Cyanoacrylates have the potential to improve long-term results of endovascular treatment of aneurysms (8). A serious drawback of cyanoacrylate embolization is the risk of cerebral infarction from polymer emboli. In this study, we included a treatment group with cyanoacrylate, which provided a reference point for lesser recurrence and improved healing at the neck (8). The goal of this study was to evaluate the potential role of the ANBD in improving angiographic results and in promoting healing of experimental wide neck aneurysms treated by coiling. A second objective was to explore the feasibility of using the ANBD as a tool to control the deposition of cyanoacrylate in aneurysms. Protocols for animal experimentation were approved by the institutional Animal Committee in accordance with guidelines of the Canadian Council on Animal Care. Surgical and endovascular procedures were performed with the animals under general anesthesia. Twenty-eight beagles weighing 10 to 15 kg were sedated with an intramuscular injection of acepromazine (0.1 mg/kg), glycopyrrolate (0.01 mg/kg), and butorphanol (0.1 mg/kg) and were anesthetized with IV administered thiopental (15 mg/kg). Animals were ventilated artificially and maintained under surgical anesthesia with 2% isoflurane. Postoperative anesthesia was provided for 3 days by a 50-μg Fentanyl skin patch. Wide neck venous pouch aneurysms were constructed after a Y-type bifurcation was created between the two common carotid arteries. Briefly, both common carotid arteries were exposed through a midline incision between the larynx and sternum. The left common carotid artery was ligated near its origin and was transected. The distal end was mobilized and tunneled to the contralateral side between the esophagus and trachea. After ligation, a 2-cm segment of the left external jugular vein, cleaned from fat and adventitia, was prepared for the anastomosis as depicted in Figure 1A. Two longitudinal, partial lateral incisions were made on the venous segment to anastomose it to the arteriotomies on the medial aspects of both carotid arteries, performed during temporary clamping. The venous segment and both carotid arteries were joined together with suture stays (Fig 1): first, points 1 and 2 to the distal edges of the arteriotomies and then point 3 in the middle of the posterior aspect of the venous segment were joined to the middle edges (A, A′) of the carotid arteriotomies; next, points B and B′ were sutured between the distal edges of the carotid arteriotomies. All structures were anastomosed by using 7.0 Prolene running sutures. The height of the aneurysm was adjusted by using ligatures or clips at the dome. This technique is used to create a “standard” Y-type bifurcation aneurysm with a well-defined neck (Fig 1B). In the current study, the model was modified to mimic the clinical situation in which the neck is wide and incorporates the origin of a branch. To do so, the length of the lateral incisions on the venous pouch was shortened (Fig 1A, 1 and 2) and the distance AB between the proximal and distal contact points of the left and right carotid arteries was reduced to a single point, as shown in Figure 1C. In the resulting model, the “anatomic neck” of the aneurysm, consisting of the wall of the venous segment, is wide and devoid of suture lines, whereas the “surgical neck” forms a “dysplastic bifurcation,” which incorporates the origin of the left carotid artery. Bifurcation aneurysms had 10- to 12-mm sacs and 6- to 10-mm necks (mean neck diameter of the three groups are detailed in the Table). Transfemoral angiography was undertaken immediately after surgery in all animals. During recovery, the dogs were fed a normal diet and their activities were not restricted. Construction of the wide neck aneurysm model. A, Artistic representation of the preparation of arterial and venous components. B, Construction of the Y-type carotid bifurcation model. C, Wide neck aneurysm model. To obtain a wide neck incorporating the origin of the left branch (left carotid artery), the distance between the proximal and distal contact points of the left and right carotid arteries is reduced to 0 (see text for details). D, Intraoperative photograph of the resulting wide neck aneurysm model. E, Angiogram of the carotid artery, obtained immediately after surgery. Microcatheters (Excelsior) and GDCs were provided by Target Therapeutics, Fremont, CA. Endovascular treatment was performed at least 2 weeks after aneurysm construction, according to techniques used routinely in clinical practice. A bolus of 800 U of heparin was IV administered after placement of 5F or 6F introducer sheaths in one or both femoral arteries. Coil embolization, with or without ANBD, was performed by maximal packing with 0.010-caliber GDCs of decreasing diameters, until coils could no longer be introduced. Sometimes, embolization had to be interrupted to avoid coil protrusion into the parent artery or to prevent stenosis of the left carotid artery. Three groups of animals were treated by using three different endovascular strategies. Ten animals with bifurcation aneurysms were treated by using coils only. The first coil was a 3D 0.010-caliber, 10 mm × 30 cm coil (n = 7) or, when the lesion was large, a 3D 0.015-caliber, 12 mm × 30 cm coil (n = 3). In 11 animals, an ANBD measuring at least 4 mm more than the width of the aneurysmal neck was positioned at the neck of the aneurysm. Coiling was then performed using a second microcatheter as described above, the first coil being a 3D 0.010-caliber (n = 8) or a 3D 0.015-caliber (n = 3) coil. Cyanoacrylate embolization was performed in a total of seven animals. A single ANBD was initially used in three animals. After positioning the device at the neck, the second microcatheter was advanced until its tip reached the wall of the fundus. The cyanoacrylate mixture of 50% n-butyl-2-cyanoacrylate (Histoacryl; B. Braun, Melsungen, Germany) and 50% iodized oil (Lipiodol; Therapex, Montreal, Canada) was then injected very slowly, and the catheter was slowly withdrawn as the aneurysmal sac progressively filled. Once at the neck, the injection was stopped, often prematurely, to avoid spilling into the parent artery. The catheter was rapidly removed after a 30-s curing period. Because of uncontrolled escape of the polymer beyond the aneurysm in one of these three animals, improved control of cyanoacrylate injection was attempted in the next four animals by using the added protection afforded by a second ANBD (one 16 and one 12 mm in diameter) in three dogs and one ANBD plus one coil (16-mm TriSpan; 8 mm × 30 cm 0.010-caliber GDC) in the fourth dog. Carotid angiography was performed in anesthetized animals immediately after embolization at 3 and 12 weeks before euthanasia by barbiturate overdose to document the degree of aneurysmal obliteration. Multiple projections were evaluated, and the results were scored according to a previously described classification scheme (9) by the same observer (J.R.). A score of 0 indicated complete obliteration, 1 indicated “dog ears,” 2 indicated residual or recurrent neck, and 3 indicated residual or recurrent aneurysm; a score of 4 was added for large saccular recurrences. The carotid arterial wall was longitudinally opened to expose the luminal surface of the neck of the aneurysms. After fixation, the neck of the aneurysms were photographed en face by using an operating microscope. Morphologic results at the neck of treated aneurysms were graded according to a classification system illustrated in Figure 2. Neointima formation was assigned a score of 0 when a thick neointima completely sealed the orifice of the aneurysmal neck, a score of 1 when the neointima was similarly sealing the neck but small areas of recanalization were seen adjacent to the transition between the neck and the wall of the aneurysm, a score of 2 when a crescent of recanalization was present around the neointima covering the coil mass or the embolic agent, a score of 3 when recanalization affected the coil mass with the neointimal covering being only partial, and a score of 4 when no neointima but only thrombus was covering most of the embolic material or coil mass. This grading system and the presence of neointimal tissue were validated by histopathologic studies that were conducted after careful dissection of the coils under microscopy (Fig 3). Pathologic specimens were studied after formalin fixation, axial sectioning, and staining as previously described (8). Neointimal formation and scoring system. Definitions of scores and examples shown by macroscopic photography of neointimal formation and recanalization at the neck of aneurysms treated with coils or cyanoacrylate. A, Thick neointima completely seals orifice of aneurysmal neck treated with cyanoacrylate. B, ANBD-assisted coil embolization treated with cyanoacrylate. D, Coil embolization without ANBD. Photographs and pathologic sections of neointima at the coil surface. A, Macroscopic photograph of the tissue found at the surface of a loop of platinum coil protruding through the ANBD (arrow). B, Tissue is dissected free of coil. C–E, Histopathologic section shows typical neointima consisting of multiple layers of fusiform cells embedded in collagen covered by a single layer of endothelial cells. Note that neointima is thinner on the surface of the coil facing the parent artery (arrow). The mean width of the aneurysmal necks were compared by using analysis of variance. For each time (initially, 3 and 12 weeks), angiographic scores were compared by using the Kruskal-Wallis test. For each treatment, angiographic scores for the three times (initially, 3 and 12 weeks) were compared by using the Friedman test. Neointimal scores at 12 weeks and the number of complications were compared by using the Kruskal-Wallis test. Complications and neointimal and angiographic scores for each time point and for each group are summarized in the Table. Examples of angiographic findings are illustrated in Figure 4. A, Obtained before embolization with coils. B, Obtained immediately after embolization with coils. C, Obtained 12 weeks after embolization with coils. This aneurysm, treated with coils only, recurred within 12 weeks. D, Obtained before ANBD-assisted coiling. E, Obtained immediately after ANBD-assisted coiling. F, Obtained 12 weeks after ANBD-assisted coiling. This lesion was stable at 12 weeks. G, Obtained before ANBD-assisted cyanoacrylate injection. H, Obtained immediately after ANBD-assisted cyanoacrylate injection. I, Obtained 12 weeks after ANBD-assisted cyanoacrylate injection. This aneurysm was cured at 12 weeks. The mean width of the neck of the aneurysms treated with coils only (7.5 ± 1.4 mm) was less than the one found in the other groups (8.8 ± 2.5 mm), but this difference was not significant (P = .33). The first 3D coil was difficult to position without protrusion in the bifurcation and necessitated multiple attempts at repositioning to respect the origin of the left carotid artery. Treatment was possible in all cases, but further packing of the sac with platinum coils resulted in left carotid occlusion in two of the first five animals. 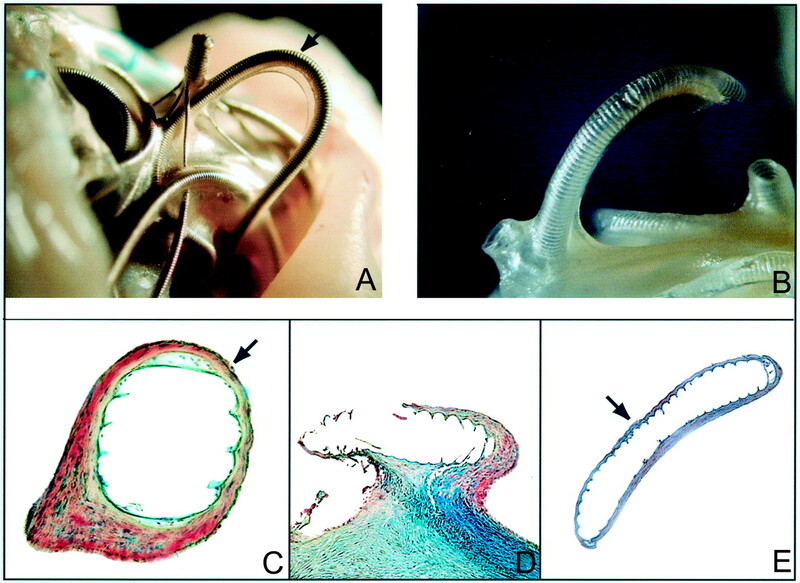 In the next five animals, coiling was deliberately performed to leave a small 1- to 2-mm residual neck but left carotid occlusion still occurred in one animal. Arterial occlusions were transient. Follow-up angiograms obtained at 1 week showed patent arteries in all cases. There was a progressive increase in the angiographic score with time, and this was statistically significant (P = .01). The 12-week follow-up angiograms showed recurrences in eight of 10 animals (Fig 4), with a median angiographic score of 3.0. At 12 weeks, the coverage of the neck by neointima was incomplete in most cases. Recanalization was sometimes minimal, involving the spaces between the mass of coils, which were well covered with neointima, and the wall of the aneurysm. Recanalization was often extensive and was found between the coils themselves (Fig 2). The median neointimal score for the group of animals treated with coils only was 2.5. The ANBD could be easily introduced and positioned at the necks of aneurysms in all cases. However, the angle between the right common carotid artery and the long axis of the aneurysm in these Y-type bifurcations caused an eccentric position of the stem, with lesser protection from coil protrusion on the left side of the neck. Transient left carotid occlusion occurred at the time of subsequent coil packing in two animals. The sudden movement of the 3D coil often caused tilting of the ANBD that had to be repositioned. The “larger loop” of the 3D design also had a tendency to slide between the ANBD loops and the aneurysmal wall, thus protruding inside the bifurcation, and required repositioning on multiple occasions. Nevertheless, treatment of these wide neck lesions was subjectively thought to be easier with the ANBD. Immediate angiographic results were not significantly different, and left carotid occlusion was no less frequent in coil-treated aneurysms with or without ANBD assistance. Angiographic scores, as in group I, also increased with time, showing a recurrence in five animals, with a median angiographic score of 3.0, but this trend did not reach statistical significance (P = .08). Recanalization between coils or between the coil mass and the aneurysmal wall was frequent, and the median neointimal score (2.0) was not significantly different from that of group I. The ANBD was sometimes covered with neointima, sometimes apparently bare (Fig 2). Platinum coils, partially covered with neointima, protruded out of the ANBD in many cases (Fig 3). Left carotid occlusion from escape of the polymer during the deposition occurred in one of three animals in which only one ANBD was used to control embolization. Cyanoacrylate deposition could be controlled with two ANBDs (three animals) or one ANBD and one coil (one animal). The microcatheter was often glued inside the aneurysm, but in this animal model, it was always possible to retrieve it. The median angiographic score immediately after embolization was improved (0.0), a difference that did not reach statistical significance (P = .08). Follow-up angiographic results were stable with time so that the median angiographic score was significantly better at 12 weeks (1.0, P = .05). Neointima formation was thicker and more uniform with small areas of recanalization at the corner of the neck in three animals (Fig 2). Neointimal scores were significantly better than the ones found in aneurysms treated with coils, with or without ANBD assistance (P = .004). In three animals, dense material was found outside the limits of the aneurysm (Fig 2) and histopathologic sections showed extruded lipid globules and acrylic surrounded by a severe granulomatous reaction. The ANBD is used in patients with wide neck aneurysms (mainly at the basilar bifurcation) because the unassisted embolization procedure in some of these lesions may not be possible (7). Furthermore, wide neck lesions may be particularly susceptible to incomplete occlusions and to recurrences (1). This selection bias precluded a direct comparison with historical controls treated with GDCs only. The previously reported animal study was performed in an aneurysmal model that could satisfactorily be treated with standard coil embolization (6). The diameter of the vessel used to construct the transverse segment of the T-shaped bifurcation limits the width of the neck of experimental aneurysms constructed. Thus, the efficacy of the ANBD as compared with unassisted embolization could not be assessed (6). The bifurcation aneurysm model used was designed such that suture lines are not present at the level of the anatomic neck. This construction minimizes the potential effects of surgical trauma and foreign body reaction on neointimal formation at the surface of the embolic agent. The goals of the new model were to mimic the clinical situation in which the ANBD may prove useful in improving initial or long-term morphologic results or in decreasing complications such as coil protrusion or parent vessel occlusion as compared with unassisted coil embolization. The modifications of the bifurcation model that we proposed resulted in a realistic model that mimicked the difficult clinical situation in which complete exclusion of the lesion may not be possible without jeopardizing the parent vessel or one of its branches. Initial morphologic results were often suboptimal, and lesions were more susceptible to recurrences after coil embolization as compared with the terminal bifurcation model (6, 8). Initially, we expected improved angiographic results after ANBD-assisted embolization. This, however, was not shown in the limited number of animals studied. Although ANBD-assisted coil embolization subjectively seemed to be easier and more controlled than unassisted coil deposition, with which coil placement was sometimes arduous, the final results were not significantly different. Complications involving the left carotid artery also occurred with ANBD assistance. Reasons that may explain this failure at improving results include deliberate under-treatment to avoid left carotid occlusion; limited movements of the microcatheter at the neck, a drawback that may be intrinsic to the use of two microcatheters plus one ANBD; and the effects of a steep learning curve by using a new device in a new model. To compare ANBD-assisted embolization to unassisted embolization, the first coil was 3D in all instances. Use of a 3D configuration for the first coil is a practice gaining popularity in certain centers (10). In clinical practice, we prefer to use the standard helical design for the first coil because each loop of platinum can be followed accurately while being deposited. The ANBD often served as a safety feature, positioned to prevent coil protrusion into the parent vessel or its branches. A shortcoming of the 3D coil is that a sudden global circular movement can occur, not allowing an assessment of the position of all loops, which ideally should remain above the ANBD. Conversely, the 3D configuration of the first coil may have contributed to the relative success of the unassisted coil embolization technique, hiding potential benefits of the ANBD by comparison. Cyanoacrylates have the potential to improve results of endovascular treatment of aneurysms (8). Therefore, the possibility of controlling cyanoacrylate embolization of aneurysm with the ANBD was explored. The use of a single ANBD failed to safely control cyanoacrylate delivery. Improved control was achieved with the use of two ANBDs. Control of polymer injection seemed to improve as more material acting as a filter was placed at the aneurysmal neck (8). Whether this strategy could reach safety levels routinely found in the clinical use of retrievable coils remains doubtful (11, 12). Another disturbing finding was the presence of embolic material outside the limits of the aneurysmal wall associated with a significant tissue reaction. One potential explanation is extrusion of unpolymerized material, encapsulated within a polymerized surface some time after embolization. We speculate that extrusion could have occurred as a result of a severe inflammatory reaction that lysed the aneurysmal wall. Because the neck was well sealed by neointimal tissue, this event did not cause any clinical event. This phenomenon, however, should be further studied. We think that cyanoacrylates, even under the protection of coils or ANBDs, are unsafe as compared with coil embolization of aneurysms. An increase in complications was not observed among the limited number of animals studied, as compared with unassisted or ANBD-assisted coil embolization. This observation emphasizes the limits of this study, especially regarding the number of animals in each group, and overall results should be interpreted with caution. Nevertheless, cyanoacrylates succeeded in improving 12-week angiographic results, showing that this goal is not an impossible task in this new model. The quality of the neointima sealing the necks of aneurysms treated with cyanoacrylate was significantly improved, as compared with ANBD-assisted or unassisted coil embolization. Improved sealing of the neck by neointimal tissue may reflect better initial angiographic results obtained with cyanoacrylate, although this difference was not significant (P = .08). Neointima formation may also vary according to the nature of the embolic agent. Coil embolization leads to occlusion by thrombus formation. This thrombus, which acts as a provisional matrix for the invasion of cells involved in healing vascular wounds, is then recanalized or progressively replaced with neointimal tissue (12). Because both phenomena may occur simultaneously, the neointimal tissue found at the neck of aneurysms is thin in some areas and thick in others within the same specimen (Fig 2). Neointimal measurements, performed on selected sections of aneurysms treated with coils, are prone to sampling bias and are less reliable than those performed in models that use sponges as the embolic agent (13, 14). Furthermore, very thin neointimal tissue can be lost during processing and sectioning of specimens harboring metallic devices. We designed a classification system for the qualitative assessment of neointimal tissue formation at the necks of aneurysms treated by embolization. This classification scheme does not only reflect surface coverage of the coil mass by neointimal tissue (15) but takes into account the recanalization process as well. It provides data for comparisons between treatments in experimental situations. We think it is pertinent, because it differentiates well-sealed aneurysmal necks from lesions with minimal recanalization that may not be visible by angiography; it also distinguishes lesions that are sealed by neointima from those that are covered by unorganized thrombi, two conditions that may share similar angiographic findings. Animals treated with cyanoacrylate had better angiographic results at 12 weeks, and their neointimal scores were also improved compared with lesions treated with ANBD-assisted or unassisted coil embolization. Mechanisms responsible for better healing at the necks of lesions treated with cyanoacrylate remain unknown. 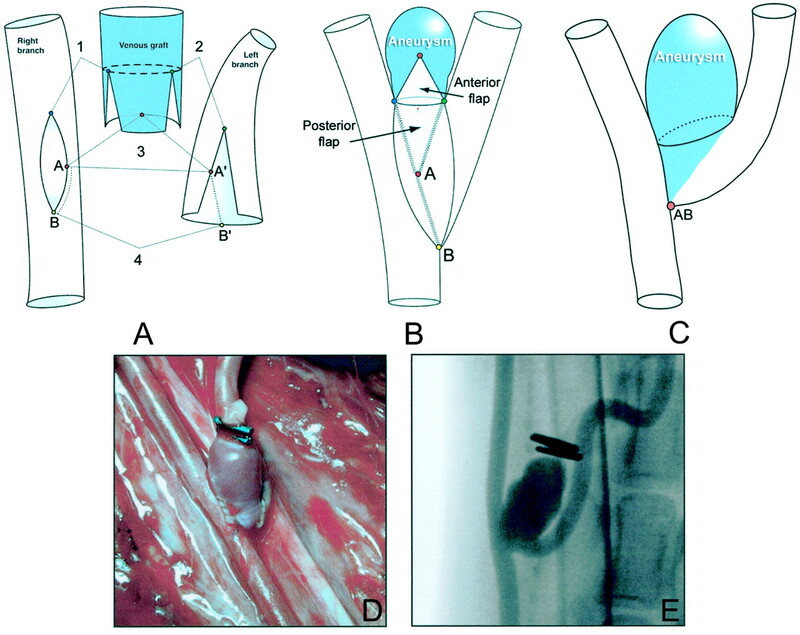 One hypothesis is that the lesion filled with polymer is not subject to the recanalization process commonly found within the organizing clot associated with platinum coils (8, 12). This recanalization process seems to be fundamental, and it was unchanged regardless of coil design (3D or helical) and whether coil embolization was assisted with the ANBD. Although ANBDs may allow endovascular treatment of difficult aneurysms in clinical practice, we failed to show improved initial or follow-up angiographic results in a limited number of animals in a new experimental wide neck aneurysm model that has a propensity to recanalize and recur. Because ANBDs are designed to be used in wide necked lesions, clinical recurrences are an expected consequence. Cyanoacrylate was more effective in changing the evolution of the experimental model, but tight control of polymer delivery is necessary before contemplating clinical application. This work was supported by a grant from Target Therapeutic/Boston Scientific and partially by Canadian Institutes of Health Research and Hearth and Stroke Foundation. Special thanks to Miguel Chagnon for expert statistical assistance and Rose-Mai Roy for preparation of the manuscript.